Bricks R Us offers you a variety of options for your brick engraving fundraiser. Engraved memorial benches, for example, are very effective for fundraising. They offer a way to memorialize a special person or event or give a dedication to someone from a class or organization. An engraved memorial bench ideal for places where there is a lot of foot traffic. Memorial sites, for instance, have many visitors walking through, and benches will give these visitors a comfortable place to sit. Browse through our selection of benches by scrolling down this page. You can also see some examples of benches we have engraved for customers in the past. Bricks R Us offers a variety of benches with different sizes, shapes, height and weight. All the prices you see on this page include shipping. An additional cost is incurred when adding a logo or symbol on a bench. Do you have any questions about our engraved memorial benches or about organizing a fundraiser? Fill out a contact form or give us a call at 888-MY-BRICK. The Bricks R Us team is here to help you plan a successful fundraiser! 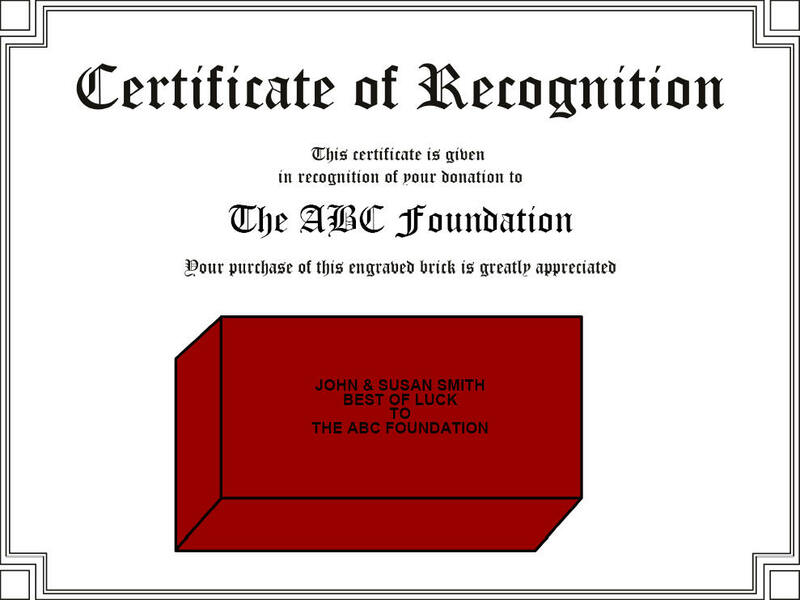 As a way to help you express your gratitude to your donors, Bricks R Us has created Donor Certificates. 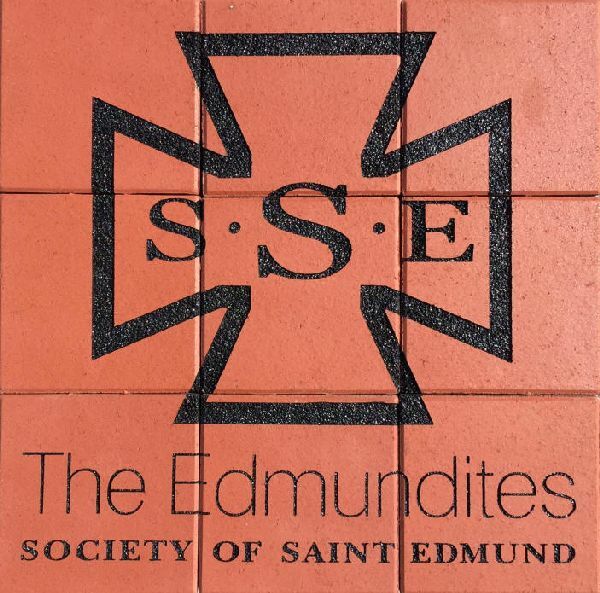 A brick engraving fundraiser certificate is a great way to say thank you to a donor and show them that you appreciate their commitment to the cause. Each Donor Certificate is laser-printed on heavy ivory paper and is personalized to each donor with a red brick engraved with the donor's inscription. Standard Certificates: $8.00 Electronic Certificates: $4.00 * Please be aware we are only able to print text on the certificates. At the moment we cannot print any logos or symbols. * Certificates are printed by a professional printing company for a quality finish. Building a successful brick fundraiser is no easy task. Between planning for the fundraiser, organizing the events and engaging enough people to donate to the cause, a brick fundraiser is time-consuming. At the end of the day, though, there is no better feeling than knowing your fundraiser accomplished what it was meant to do. And while there is a lot to be thankful for, one can never forget the people that made the fundraiser a success – the donors! No amount of organizing and planning would matter if no one donates to your brick fundraiser. Thus, you always want to say thank you to your donors for their contribution. This display of gratitude goes a long way in showing your donors that their donations helped make the fundraiser a success. Contact us today to learn more about purchasing certificates! Part of organizing a successful brick fundraiser is to raise awareness about your cause and your fundraising campaign. Bricks R Us has more than 25 years of experience in helping organizations plan their fundraisers; this includes helping them with their marketing efforts. As your partners for your upcoming fundraiser, we would like to help by providing you with order forms and free trifold brick fundraising brochures. If you have a particular type of brochure in mind other than a trifold brochure, feel free to show us a sample and we will do our best to accommodate you. You can email us the sample you have in mind, or call our customer service. Our main goal is to help your brick fundraiser succeed! Creating the Brochures To create the brochure for your organization, log into your account within the Online Ordering System and click on the brochure menu bar. You will need to complete the brochure questionnaire available on the page. Our team at Bricks R Us will use your information to create a professional template of the brochure. Keep in mind that Bricks R Us does not print the brochures. Our team will email you the PDF template within seven business days after you submit your brochure request. When submitting your brochure request, please include your organization's logo (if applicable), pictures, and at least two paragraphs explaining the campaign. 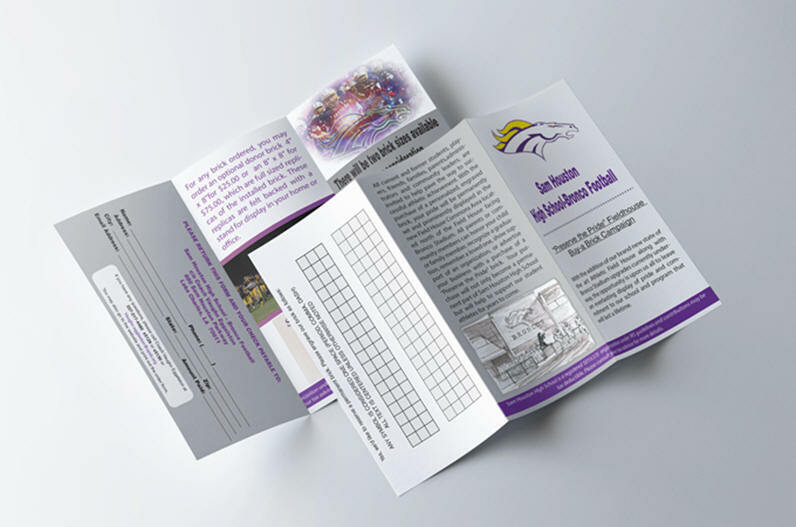 Do you have any other questions about our brochure services? Give us a call at 888-MY-BRICK! When engraving personalized bricks for your next fundraiser, there is no need to settle for plain text. Bricks R Us offers many options to make your fundraiser a unique, personalized experience. With Bricks R Us, your options are endless! Pick from a variety of brick options and sizes. Customize your brick color and be creative with your engraved message. Want to add a symbol to your bricks? We’ve got you covered! Bricks R Us offers over 300 different types of symbols, ranging from holiday designs to school mascots. If you would like to get creative with your bricks and personalize them even more, we recommend adding arrays. An array consists of your text engraved over a number of individual personalized bricks. Customers often use arrays as headers on a selected area; each brick or tile has one word on it. The cost of an array is the normal engraving price plus an array fee of $30.00 per 4 bricks. Scroll down this page to see examples of arrays we have engraved for customers in the past. Are you ready to start a fundraiser with personalized bricks? Contact Bricks R Us today! We are looking forward to helping you plan a successful brick campaign and make it unique to your organization. Our phone number is 888-MY-BRICKS. If you’d prefer to write us an email, you can submit a contact form and one of our customer service representatives will get back to you within 24 hours. Happy Fundraising!